Verizon Wireless is probably best known for having arguably the best cellular coverage around the country. However, that coverage comes at a price as wireless plans can be very expensive once you start adding devices (as a Verizon customer myself, I know this all too well). 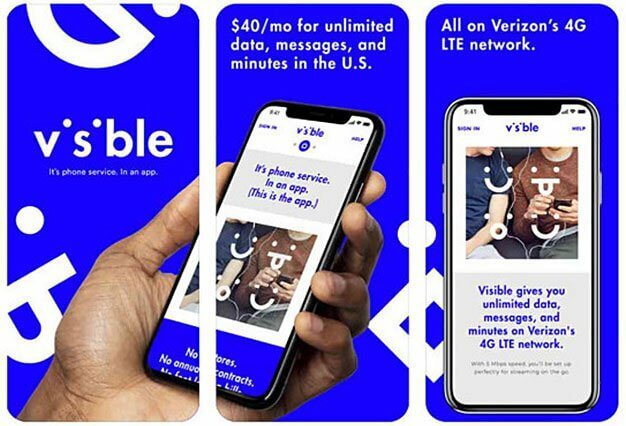 For those budget conscious customers, Verizon has quietly launched Visible Wireless, a cellular service with unlimited everything…with some caveats. Before we get to those caveats, let’s get the specifics out the way. For $40 per month, you get unlimited data, texting, and minutes and there is no contract involved. As an added bonus, Visible will not throttle your data speeds once you reach a certain threshold. In order to subscribe, you actually have to download the Visible app and register your account. Once your account is registered, you’ll receive a SIM card in the mail. Payment can also be done via PayPal or Venmo if you don’t fancy using a credit card. Now for the caveats. First, in order to create an account, you must be invited by someone who is already a Visible subscriber. Second, the app is only available on iOS so Android users need not apply (for now) and the iPhone must be unlocked. Third, and probably most crucial, Visible limits download speeds to 5Mbps and video is only in 480p. Visible's brand strategy is an interesting take on marketing cellular service and seems geared towards millennials. The service is offered via an iOS app and new subscribers are gained through basically word of mouth. It uses online payment systems like PayPal and no has brick and mortar stores of its own with customer service being entirely virtual. Subscribers can start and stop service wholly through the Visible app. This may not be a horrible proposition for those who just need a cheap unlimited data plan and don’t mind slower speeds. The no-contract means that you could leave whenever you want. This may also be an effort by Verizon to head off any people leaving their post-paid wireless service.